THE NEW Top 14 rugby season kicks off on August 19, less than two months after a world-record crowd of 99,124 saw the curtain come down on the last one when Racing 92 stunned Toulon at Barcelona’s Nou Camp to win with just 14 men to lift the Bouclier de Brennus. A month earlier, the Ligue Nationale de Rugby (LNR) unveiled a record Top 14 TV rights deal that will see broadcaster Canal Plus pay €97million a year for the exclusive domestic rights to French top-flight rugby from 2019 to 2023, eclipsing the current €74m-a-year deal which runs out at the end of the 2018/19 season. The new deal, the LNR said, gives Top 14 clubs the financial security they need to plan for the future. So, it would seem, domestic rugby in France is in rude health despite the national side’s struggles in recent years and the many complaints over the length of the season. Journalist Richard Escot, who has covered club and international rugby for the sports newspaper L’Equipe since 1985 and written biographies of its biggest names, agrees. “It really is the most difficult competition in the world and it can be spectacular for players and coaches who want to play rugby, a real game. 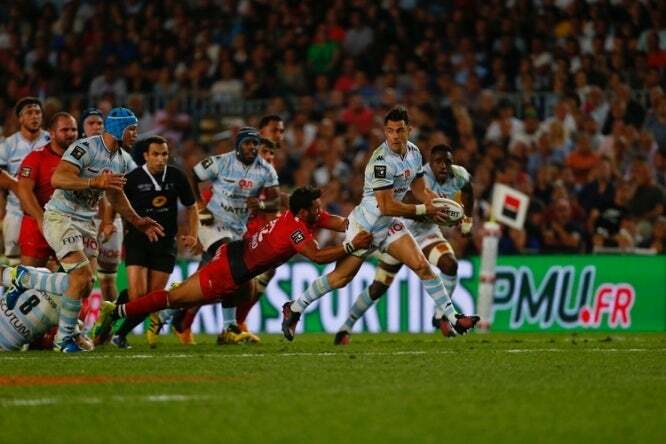 In the semi-final, big-spending Racing 92 edged past long-time league leaders Clermont 34-33 in an epic game, courtesy of a dramatic late try from Argentinian Juan Imhoff, that was coolly converted by stand-off Dan Carter, the world’s first €1m-a-year player. A week later, the former All Black put in another man-of-the-match performance in Spain after his side lost scrum-half, Maxime Machenaud, sent off for a dangerous tackle on Toulon’s Matt Giteau with less than 20 minutes on the clock. Despite being a player down for more than an hour, Carter – aided by the long-range accuracy of Johan Goosen, who kicked three penalties, and a well-taken Joe Rokocoko try – guided Racing to a 29-21 win. Those two games, despite everything at stake, ran contrary to a common criticism of the Top 14 – that it is a dour, defence-oriented competition. It may be no surprise that players are unable to turn on the style every week. By the time the referee blew the final whistle at the Nou Camp, Racing – who had also reached the final of the European Champions Cup, where they lost to English Premiership side Saracens – had played 20 matches in as many weeks. Thanks to the Rugby World Cup in England, last season was unusually long, but the 26-week Top 14 – with the added challenge of the European competitions – means the new rugby year will not end until June 4, 2017... a mammoth 41 weeks later. It is the longest professional domestic rugby tournament in the world. 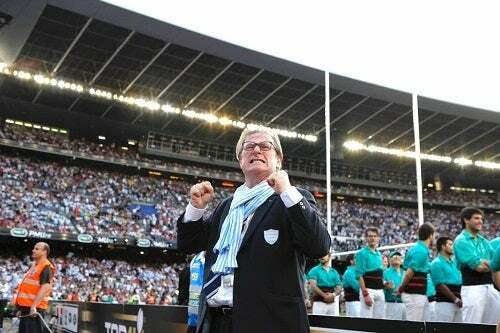 The win in Barcelona was a long-awaited reward for Racing’s wealthy owner Jacky Lorenzetti, who took over the club in 2006, the same year Mourad Boudjellal took the reins at Toulon. At the time, both clubs were languishing in the second tier of French rugby, the Pro D2. Until June 24 this year, however, and despite spending heavily on players, Lorenzetti had seen no silverware return for his financial investment, compared to Boudjellal’s three European crowns, as well as both the Top 14 and Pro D2 titles. Mr Escot said wealthy owners – including Bordeaux’s Laurent Marti, Stade Français’ Thomas Savare as well as Lorenzetti and Boudjellal – have been the making of the Top 14. He said: “Without these presidents, we would not have the Top 14 that we know today. Today’s wealthy owner-presidents are following a trail blazed more than 20 years ago by Savare’s predecessor at Stade Français, Max Guazzini. All is not entirely rosy in French rugby, however. The Canal Plus TV deal is one thing, persuading the same owners to accept a new deal intended to improve the fortunes of the ailing French national side is another matter, Mr Escot feels. Last month, following a review after New Zealand thrashed France 62-13 in the World Cup quarter-finals, both the LNR and the Fédération Française de Rugby (FFR), announced an agreement that allowed national coach Guy Novès to have a greater say over the club workload of 30 ‘Elite Players’. The deal, similar to that between clubs in the English Premiership and the Rugby Football Union, limits the game time of these 30 players, and states that they will be made available to the national team for extended periods around the time of the November internationals, the Six Nations and before the 2019 World Cup in Japan. He also questioned the ‘Jiff’ quota system of France-bred players that is intended to improve the quality of the pool available for selection to the national side. The joueurs issus de la filière de formation system gives priority to players who have spent several years playing rugby for French clubs’ junior sections – known as écoles de rugby – or spent three years before the age of 21 in approved academies. From next season, 14 players out of the matchday squad of 23 must be Jiff players. But the system has flaws: former England players Steffon and Delon Armitage are Jiff qualified as they lived in Nice and learned their rugby there as teenagers, while Oise-born French international Jérôme Thion is not Jiff qualified as he came to the game too late in his youth. Mr Escot said: “It’s like all existing rules, if you do not bend them they are good. Look at Clermont, which is creating an academy in Fiji. But he refused to criticise players - such as South Africans Rory Kockott, of Castres, and Clermont’s Scott Spedding – who decided to nail their colours to the French mast after qualifying to play for the country on residency grounds.